Bag Balm contains 0.3% 8-Hydrozyguinoline sulfate for an antiseptic approach to treating abrasions and wounds. 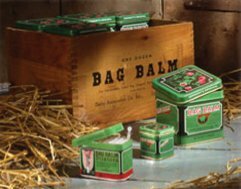 Bag Balm has a petrolatum and lanolin base to keep superficial tissue moist and soft. Bag Balm goes on fast and stays on. Bag Balm was originally created in Vermont to treat the udder area after milking cows. 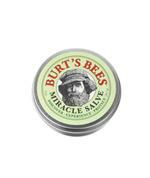 This time-test ointment is now being used on pets and people for chapped skin and minor skin irritations. Bag Balm is an Alcohol-free formula salve ointment. The Vermont Original, Bag Balm, in the familiar green tin. 8 ounces of Bag Balm to sooth and moisturize all kinds of skin, for pets and people.